The (Monkey) Business Of Recognizing Words New research shows that first-graders and baboons have at least one thing in common: Both can tell the difference between actual written words and random sequences of letters. The finding challenges some conventional ideas about what goes on in the human brain when we read. New research shows that first-graders and baboons have at least one thing in common: Both can tell the difference between actual written words and random sequences of letters. This finding challenges some conventional ideas about what goes on in the human brain when we read. Scientists have assumed that reading relies on the same brain circuits involved in spoken language, but now they are considering a more complicated explanation, thanks to six baboons who took part in an unusual experiment. The baboons live in the south of France, spending their time in an enclosure that includes nine testing booths. 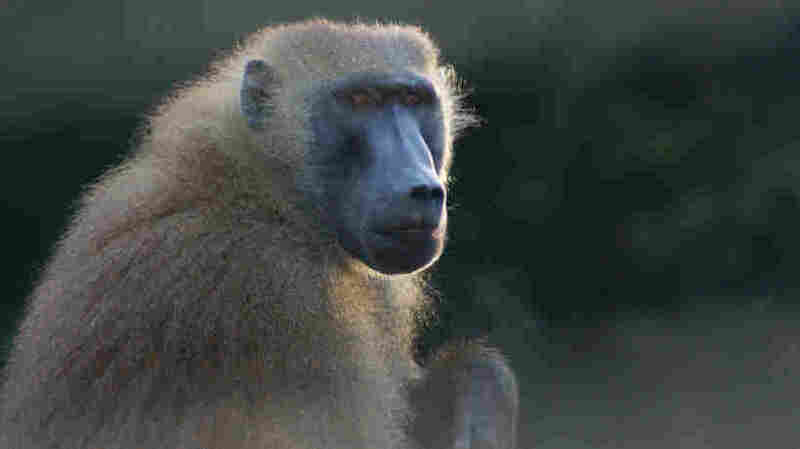 Jonathan Grainger, a researcher at Aix-Marseille University, says that baboons, like first-graders, can be motivated by food and video games. So he put treats and touch-screen computers in the testing booths. In an experiment in France, baboons were allowed to choose whether a string of four letters was an English word or not. If they chose the right answer, they received a food reward. After six weeks of tests, they chose correctly 75 percent of the time. "[The baboons] just go up and do an experiment whenever they want, basically," Grainger says. "There's no stress to the animal. They're doing this because they want to." Grainger says the baboons had to step into a booth and tap the screen. "The first thing that comes up is a string of four letters, which at random could be a real English word or what we call a 'non-word' — a string of letters that's not a real English word," he says. Then the baboons had to indicate whether they were looking at a real word like KITE, or a non-word like EKTI. After doing this thousands of times, all of the baboons learned to recognize at least 80 words, even though they had no idea what the words meant. And Grainger says a baboon named Dan learned more than 300 words. "Dan's our star baboon," he says. "He's a high-performing individual, basically. He does well in most tasks." Dan's our star baboon. He's a high-performing individual, basically. He does well in most tasks. But here's the amazing thing: Dan and the other baboons also learned to tell whether a string of letters they'd never seen before was an English word. That's something first-graders learn to do when they start reading, but scientists had assumed that children were simply sounding out the letters to decide whether they make sense. Of course, the baboons couldn't do this because they're not learning to read a language they already speak. They had to rely on a part of the brain that can tell whether objects fit a known pattern. This is where the experimenters started learning from the baboons. Grainger says his team realized that when people see a word, they are probably doing the same thing as their primate cousins. "The part of the brain that we use to recognize words when we're reading is actually part of the more general brain region for visual object identification," he says. "I was really looking for holes to poke in this study, but it was very difficult to find any because it was really beautifully done," he says. "And I think the linchpin here was that the baboons, once they had learned the rule, could generalize to new words that they had not seen before." Platt says when you think about it, the finding makes sense, given what's known about human and animal brains. "Brains are always looking for patterns," he says. "They are always looking to make some statistical pattern analysis of the features and events that are in the environment. And this would just be one of those." "It's a very different way of thinking about what reading and writing really are, and it could have some implications, for example, for thinking about how we might improve education in reading and writing for young children," he says. Take children with dyslexia; the baboon study suggests their problem might be in parts of the brain that identify objects, not the ones that process language. The new research appears in the journal Science.